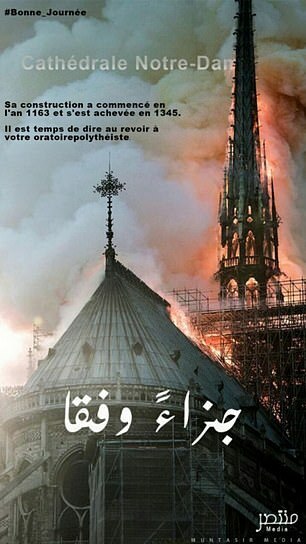 Islamic State fanatics are heartlessly revelling in the inferno at Notre Dame Cathedral online calling it ‘retribution and punishment’, according to terror intelligence researchers. ‘The worse has been avoided, although the battle is not yet totally won,’ the president said, adding that he would launch a national funding campaign on Tuesday and call on the world’s ‘greatest talents’ to help rebuild the monument. ‘Notre Dame of Paris is our history, our literature, our imagination. The place where we survived epidemics, wars, liberation. It has been the epicenter of our lives,’ Macron said from the scene. Notre Dame was ravaged as the fire swept across the top of the building around a renovation project before its spire collapsed, threatening priceless architecture and artworks throughout the cathedral. The 12th-century church is home to relics, stained glass and other incalculable works of art and is a leading tourist attraction. French media quoted the Paris fire brigade as saying the fire was ‘potentially linked’ to a 6 million euro (£5.2 million) renovation project on the spire and its 500 tons of wood and 250 tons of lead. One firefighter was injured, among some 400 who battled the flames for hours before finally extinguishing them. Firefighters continued working through the night to cool the building and secure the monument and announced on Tuesday morning the fire had been extinguished. The blaze started at 6.50pm after the cathedral had closed to the public, and spread to one of its landmark rectangular towers. As the spire fell, the sky lit orange, acrid smoke rose in plumes and flames shot out the roof behind the nave. Hundreds of people lined bridges around the island that houses the church, one of the most visited tourist attractions in the world. As the cathedral burned, Parisians gathered spontaneously to pray and sing hymns outside the church of Saint-Julien-Les-Pauvres across the river from Notre Dame while the flames lit the sky behind them. Built in the 12th and 13th centuries, Notre Dame is the most famous of the Gothic cathedrals of the Middle Ages.